The Topps Heritage sets are some of our favorite modern baseball cards here at DeansCards.com, so we wanted to give a quick preview for the 2011 Topps Heritage baseball card set. The singles will be available on DeansCards.com in the first week of February. The 60th Anniversary theme that was so heavily emphasized in the 2011 Topps set is not emphasized in this set. 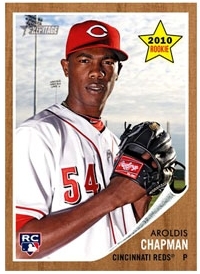 Instead, Topps focuses more on the 1962 Topps baseball card set and how it relates to the 2011 Topps Heritage set. 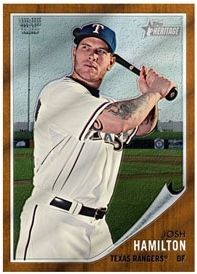 The 2011 Topps Heritage base set will consist of 500 total cards that have the same template as the 1962 Topps set. The distinctive wood-grain border makes these cards stand out from previous Heritage sets. There will be 6 World Series highlights, 11 combinations, 4 league leaders, 24 Sporting News All-Stars, 18 team cards, 8 rookie parades, and 9 in action shots. There will be 75 high number short prints. 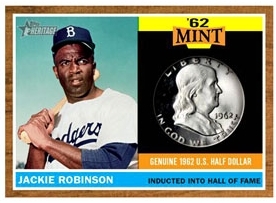 The 1962 Mint idea is one of the newest and most innovative that Topps has ever implemented into their Heritage sets. Topps picked 20 total players and for a specific event, a coin minted in 1962 is embedded in the card. Birthdays get pennies, nickels on rookie debuts, dimes for personal history, quarters for baseball highlights, and silver dollars on Hall of Fame inductions. Topps also decided to include stamps, both new and from 1962, in this set. As expected, there will be numerous autograph and relic cards, as well as inserts like New Age Performers and Flashbacks. In the hobby boxes, Topps decided to include box loaders, which consist of Baseball Bucks, advertising panels, stamp albums, and 1962 original cards. Baseball Bucks are a new idea that puts baseball players on currency of different denominations. I bought a box of 24 packs costing me 80.00 and was disapointed on 2 counts, 1) My real one autograph when i went to redeem it my code came up as incorrect!!! 2) I could not believe the amount of common cards. Only 10 percent were worth anything my green refractors are all no names and under achievers ie, M Cuddyer, N Morgan, B. Lidge etc. I do not see the VALUE in my purchase!! !